1. No Method for Attaining Rationality. Rand waxed eloquent on the merits of "reason" and rationality, yet never really explained how to attain it --- at least not in sufficient detail. Instead, she left us quite a bit of moralizing rhetoric about forming concepts "properly," or "focusing" your minds, or integrating your thoughts into a logical whole. Some of her theories concerning knowledge, especially those revolving around definitions and concepts, are factually erroneous. The very term "conceptual knowledge," which she enjoyed bandying about, could be regarded as a contradicto en adjecto --- a contradiction of terms. Concepts are items of description, not units of knowledge, and are therefore neutral in terms of their truth or "validity." Rand's insistence on the importance of consciously formed articulable knowledge is badly misplaced. Actual knowledge (i.e., the cognitive processes that real human beings use in world of fact) work very different from how Rand imagined --- as cognitive scientists have known for decades. Even worse than all this is the example Rand left to the world by her own conduct. When engaged in Q&A in front of an audience, she would not shrink from vicious personal attacks against anyone, even persons sympathetic with her philosophy of Objectivism, who asked a question she was uncomfortable answering. Rand was hypersensitive to anything she perceived as an attack, which made it very difficult for her to engage in rational discussion with people who disagreed with her. 3. No method of attaining political ideals. As Objectivism evolves, the political side of it gains increasing importance. Let's face it: many people are attracted to Objectivism chiefly for political reasons; and most of the hostility Objectivism inspires among its critics has its source in differences over political ideals. Yet despite the strong political orientation of Objectivism, its most prominent spokesmen, along with the movement in general, have virtually no influence over the public policy of any country in the world. As a political movement, Objectivism is a failure, and part of the reason for this is that Rand and her followers never provided any effective technology for persuasion. How could they? 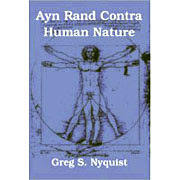 Since Objectivism has a seriously flawed view of human nature, it would unreasonable to expect Rand or any of her disciples to come up with an effective theory of persuasion. Quite the contrary, Rand and Peikoff seemed to believe that the course of history could be change by refuting the epistemology of Immanual Kant --- hardly an effective strategy for changing the world. It looks like Objectivism is dying. The ARI last month laid off 1/3 of its staff because it lost a major donor (no one knows which). Organized Rand cultism was going to die any way because Rand's philosophy is implicitly hostile to family formation. That's why the aging, childless Kool-Aid drinkers in both ARI and the Atlas Society have depended on trying to replenish the cult's ranks by recruiting teenagers and college students from normal people's families, whether these youngsters want to read Rand's novels or not. America's demographic transformation into a predominantly Hispanic country just makes this strategy harder to implement because Latinos generally don't like to read. "Rand was hypersensitive to anything she perceived as an attack, which made it very difficult for her to engage in rational discussion with people who disagreed with her." Not an admirable trait, to be sure. But as we all know, it doesn't prevent one from becoming President of the United States. I'm not an expert on non-profits, but the ARI seems kind of top heavy if losing one big donor means you lay of 1/3 of your staff. In March 2018, ARI announced that Tal Tsfany, co-founder of the Ayn Rand Center Israel, will take over as the president and CEO of ARI on June 29, 2018. When Tsfany was named CEO, the ARI said that Brown was hired as an interim CEO, which was news to everyone. When Brook ceased being CEO he was named as a member of the board. Brook was making almost 450K as CEO and must have taken a big cut when named to the board. (The IRS frowns on paying board members more than 100K). So it looks like this was a long time coming, but no one knows the detail. Peikoff is retired so maybe it's one big donor pulling the strings. "It looks like Objectivism is dying. The ARI last month laid off 1/3 of its staff because it lost a major donor (no one knows which)." Neil that's some juicy news you got there! Help us out with a source? Yaron said on his radio show that the ARI had "significant downsizing" in May because it lost a "major donor." That it was around a third of its 50 employees is the scuttlebutt. ARI announced that Tal Tsfany, co-founder of the Ayn Rand Center Israel, will take over as the president and CEO of ARI on June 29, 2018. The question here is whether Tsfany will follow in Brook's footsteps or whether he has his own agenda. I always suspected that Brook wanted to downplay the more philosophical side of Objectivism (the epistemology, the metaphysics, the theory of history) and turn ARI into a libertarian advocacy institution. But he may have been hampered in achieving this goal by Leonard Peikoff, who cared more about his own legacy as the chief enforcer of Randian orthodoxy than in promoting libertarian ideas. In some ways Brook was out of place at ARI. He did not have the personality type of the typical orthodox Objectivist. He wasn't particularly dour or thin-skinned or uptight. On the contrary, he comes off as fairly agreeable (at least for an Objectivist). At times, he's even self-effacing. He doesn't seem all that interested in the more abstruse (and often more fallacious) parts of Objectivism. I rather suspect that Ayn Rand would not have approved of him. Brook is currently attempting to become a YouTube/podcaster pundit. He's trying to cultivate relationships with members of the so-called "dark web" (i.e., Dave Rubin, Sam Harris, Jordan Peterson, etc. ), but other than Rubin and Gad Saad, no one will talk to him, so Brook is having a hard time of it. His view numbers on YouTube aren't all that impressive. Greg: "He [Brook] wasn't particularly dour or thin-skinned or uptight. On the contrary, he comes off as fairly agreeable (at least for an Objectivist). " Have you ever listened to him? Everyone he disagrees with is dumb, stupid, a liar, a racist, a collectivist, etc. I wonder if Carl Barney closed his wallet to ARI because of questions about his background in the 1970's as a high-ranking Scientologist. After L. Ron Hubbard kicked him out of the Scientologists for financial wrongdoing, Barney apparently shopped around for another cult that would take him in, and it looks like he settled into Peikoff's branch of the organized Objectivist movement. I've mostly heard Brook in YouTube conversations he's had with Gad Saad, Dave Rubin, and "Sargon of Akkad." Perhaps because he wants to become a member of the intellectual dark web, he's on his absolute best behavior when talking to these YouTube luminaries. But I have found him considerably more agreeable, even to the point of self-effacing humor, than other orthodox Objectivists. In the discussion with Gad Saad, Brook praised Sam Harris's intelligence and Jordan Peterson's views on honesty. When he engaged in criticism, he was fairly good-natured about it. In short, in these discussions, he did not come off as particularly censorious or arrogant or tone deaf, as often happens with orthodox followers of Rand. "— Yaron Brook on the Yaron and Amy Show, 28 April 2018, titled 'Why Not "Atlas Lobbied"?'" My friends, these people are lunatics. As far as I know, Brook has not said anything about this when he's talked to people like Gad Saad and Dave Rubin. I doubt Saad or Rubin know about this. (It would seem that Amy Peikoff brings out the worst in Brook.) Now Rubin is trying to get Brook on the Joe Rogan podcast. But if that should ever happen, and Rogan finds out about these views, Brook will definitely be called to account. — Yaron Brook on the Yaron and Amy Show, 28 April 2018, titled 'Why Not "Atlas Lobbied"?'" If Brook ever appears on Joe Rogan's podcast, somebody needs tell either Rogan or the producer of his podcast about this quote. As long as Rogan knows about it, I have confidence that he will challenge Brook about it. Brook also said recently that he supports torture. There was a plan in the 1950s, Operation Vulture I believe it was called, to use nuclear weapons in Southeast Asia. My understanding is that it was Vice President Nixon who put a stop to it.